At Cascade Christian Church (Disciples of Christ) we are serving Christ, Communion, and Community with open hearts, open doors, and open minds. We would love to have you come worship with us some Sunday morning at one of our three services. Take a look at our web site and all that we have to offer; and if you have any questions, please contact us at the church office at (616) 949-1360. Your Christmas Offering impacts Disciples ministries in Michigan. Luke 2:25-32 -- through the Holy Spirit we too can see the light of revelation ... we can BELIEVE AGAIN ... Anticipate the miracle. "The ways that the Michigan Region has supported me are too many to count. I went to Chi Rho Camp and CYF Conference back in the 1960s. Those experiences shaped my understanding of my faith and were part of the prompting I received to pursue ministry. 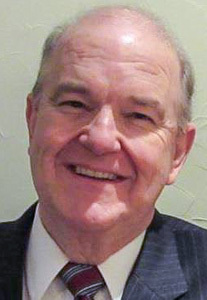 The Region supported me during the time I was at the Divinity School and helped me with my first church in Dowagiac. Recently, here at the United Church of Wayland, our Regional Minister assisted us in the calling of a new permanent pastor. Eugene James is a blessing to all our congregations. I am happy to join you and the others in support of the Christmas Offering. Your Christmas Offering helps make experiences like these possible. 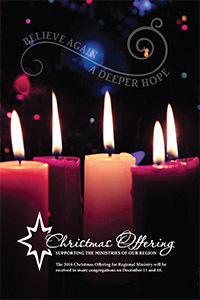 Be sure to use the special envelopes and place gift your church offering plate, marked "Christmas Offering." Or make a personal donation NOW ONLINE. Click Here. Donate at your church this Sunday - marked "Christmas Offering"
To view a video of the 150th Year-long celebration, click here. Cascade Christian Church celebrates 150 years since it was founded in 1864! Our celebration begins in October 2014 and runs through October 2015. Watch this space for more details on upcoming events. with Rev. Bob Cueni speaking on "Where We Came From ". Ice Cream Social following this service. Also, did you know to commemorate our church's 150th anniversary, we are replacing the cross in the courtyard. The new cross will be in bronze in a very rustic and organic design. Mic Carlson is a multi-talented local artis who specializes in religious art and has a passion as a bronze sculptor. He has enthusiastically agreed to take on this project. The cross will celebrate our last 150 years and stand with us for the next 150 and beyond. Please consider a special contribution to this project. Moving back to the Sanctuary! Click HERE to view Apr 14 Service. Click HERE to view Video Lead-in to last week's Sermon with Ray Gaylord. Operation Santa Claus touches families throughout the community and is always looking for volunteers and donors. Click HERE to view a video about OSC. The annual Thanksgiving dinner for seniors was held in Nov 2018. Click HERE to view a video showing the fun and fellowship of the event. Click HERE to see a short video featuring Camp Crystal kids, counselors and activities in the summer of 2017.